Figure 1. In this cross-section of citrus tree trunk, the long, dark tunnels are galleries created by ambrosia beetles. The larger stained area was caused by a currently undetermined pathogen. In October 2018, a potential “new pest” was found in large numbers in one grove in Hernando County, Florida. The damage to trees was dramatic, with dark staining throughout the trunk of the tree and beetle damage evident. It was something that would put any grower, Extension agent or researcher on alert. 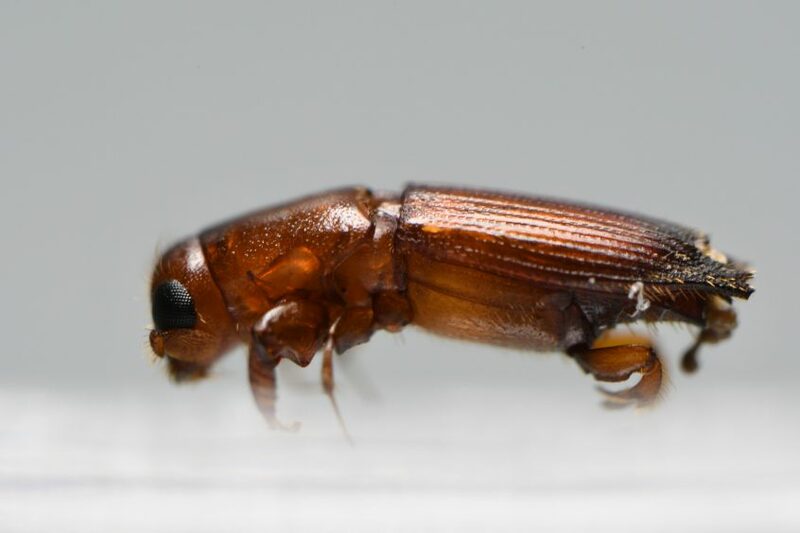 Fortunately, by working with Jiri Hulcr’s forest entomology lab at the University of Florida in Gainesville, we were able to determine that the ambrosia beetles which have emerged from the wood are not of concern. Ambrosia beetle is the common name for a very large group of small, wood-boring beetles that live in dead or severely stressed trees or untreated cut wood. Ambrosia beetles are attracted to the odor that these trees put off. Once they locate a host tree, they chew into the wood, creating a tunnel or gallery (Figure 1 and Figure 2). The debris from these galleries, which looks like sawdust, can often be seen on the outer bark of a colonized tree (Figure 3). Figure 2. Beetle galleries (dark, long tube-like areas) and vascular tissue staining can be seen in this citrus trunk. These beetles bring spores of their associated fungus into the tree, where they “farm” the fungus to feed their offspring. Once the fungus begins to grow, beetles will lay eggs. Both the larvae and adult beetles will feed on the fungus. When the larvae complete their development, which can take several weeks to months depending on beetle species, tree host and weather conditions, adults emerge and seek mates and new host trees to start the cycle all over again. Figure 3. Sawdust on the exterior of trees is often the only obvious sign of ambrosia beetles and other wood-boring insects. 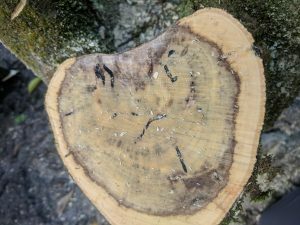 Because ambrosia beetles generally prefer dead or declining trees, they are not typically a problem for healthy trees. Only five to 10 known species cause damage to important tree species. The vast majority are harmless forest dwellers functioning as “nature’s recyclers.” However, there are exceptions. 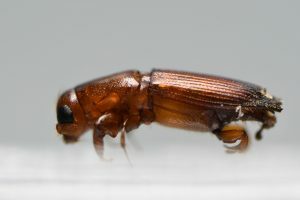 An example is the redbay ambrosia beetle (Xyleborus glabratus), which is known to transmit the fungal pathogen (Raffaelea lauricola) that causes laurel wilt disease in redbay and avocado plantings in the Southeast. Trees can become stressed for a variety of reasons, including too much or too little water, lack of nutrients, physical damage and disease. Given the broad range of climatic conditions in Florida and the endemic pressure of HLB, it is not surprising the citrus trees in the state may be under some level of stress that can help other pests/pathogens establish. But how stressed does a tree need to be to attract ambrosia beetles? 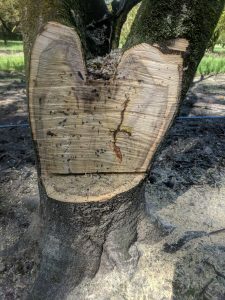 There were signs of several potential stressors in the citrus tree trunk we removed in October that could have led to the severe decline noted by the grower. For example, beetle galleries occurred in association with apparent fungal staining, but also occurred without visible fungus. We investigated possible factors that may have led to the tree decline. Because this grove has experienced flood events in recent years, an experiment was designed to determine if flood damage combined with HLB infection could yield sufficient stress to attract beetles. Figure 4. Euplatypus compositus (male pictured) was the most abundant ambrosia beetle in the infected citrus wood samples. The tree trunk was placed in a large insect cage in the lab for several weeks, which allowed larvae within the wood to continue developing and emerge as adults. Adults were collected and sent to the forest entomology lab for identification. The most frequently collected adult beetle, Euplatypus compositus (Figure 4), was used to test beetle attraction to stressed trees in greenhouses. The response of beetles was tested in citrus trees with and without HLB infection and water stress. Beetles were released in cages containing two HLB-positive and two HLB-negative trees per cage, with one tree of each infection status receiving normal watering and the other receiving a flood treatment (excess watering). Sets of at least eight beetles (4 male, 4 female) were introduced to each cage and allowed to choose trees at random for colonization. Trees were checked for damage at a regular interval for a period of three weeks. No trees showed signs of beetle damage, and no live beetles were recovered. This suggests that these trees were not suitable hosts for this species of ambrosia beetle. 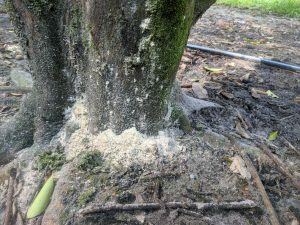 Therefore, it is unlikely that the tested trees with or without HLB, flood damage or a combination of the two were sufficiently stressed under these experimental conditions to attract this ambrosia beetle. While this preliminary experiment does not rule out the possibility that citrus stressed by a combination of HLB disease and flood stress could not attract ambrosia beetles, it seems unlikely, at least for this species. Based on these findings and the unusual staining of vascular tissue, it is likely that the citrus tree in question and those nearby with signs of beetle damage were in decline prior to the establishment of beetles. Pathologists from Megan Dewdney’s citrus pathology lab at the Citrus Research and Education Center in Lake Alfred and Jason Smith’s forest pathology lab in Gainesville are currently working on identifying the fungus or pathogen associated with the dramatic staining found as a result of exploring the visual signs of beetle damage. Lauren Diepenbrock is an assistant professor at the University of Florida Institute of Food and Agricultural Sciences Citrus Research and Education Center in Lake Alfred.